Some books you read because you feel obligated: Your work, syllabi, or well-meaning friends say you must, so you capitulate. You peruse the paragraphs with as much enthusiasm as you would an IRS audit notice. You are relieved when the last sentence is within view, like seeing land after being stranded for days on a dinghy. The part you like best about the book is closing it. No. Actually, the best part is accidentally leaving the book on a park bench or at the laundromat. Some books you treasure so much that you have to possess them. One of them becomes the cornerstone of your private library. You can recite whole pages verbatim. Still, you delight in revisiting it again and again, knowing that each read will yield as well as fulfill the promise of a new discovery. Toni Morrison’s Sula is one of my favorites. By the first sentence, I am always happily transfixed. Countless books have been written on the subject of friendship, but any narrative powered by Toni Morrison’s genius is bound to be compelling and at once unforgettable. Walking past a bookstore one day, a small, Nepalese girl with bright eyes called out to me. I looked. There was but one word above her veiled face: SOLD. I went into the store to investigate. The book’s back cover offered a lesson in basic math: “I do the calculations. And realize I am already buried alive.” Instinctively, I knew the words belonged to the Nepalese girl with the bright eyes. I was eager to know more about her. SOLD is written in a series of subtle vignettes that usher the reader through the labyrinthine mountain roads of hope, the abyss of unfathomable despair, and back again. I tell everyone I know to read SOLD. Now, I’m telling you. Patricia McCormick is the author. If you’re not already a fan, you will be. Years ago, a violent boy-man smashed my car’s rear window. My copy of Jean-Paul Satre’s Les Jeux Sont Faits had peered like a prop from underneath the shattered glass. As disturbing as the incident was, the optimist in me appreciated the near-perfect irony of it all; my foray into existentialism stopped abruptly, of course. Game time was over. And then I met The Stranger. Now, here’s a book by Albert Camus about the absurdity and meaninglessness of everything, including smashed rear windows. Yet, with every read, The Stranger only reinforces my faith in the unseen authority that is far greater than any boy-man’s propensity for violence. My man James Baldwin! I love every book by this noble figure in the canon of American literature. One of the many issues people had with Baldwin was that he did not delve deeply enough into the African side of the African-American narrative. He seemed more interested in themes that had everything to do with being just plain human instead. He lingered for too long on the individual. He took his time fleshing out a single character only to eviscerate and strip him to the bone, revealing too many secrets that everybody knew were not fiction anyhow. But how do you not appreciate a book like Just Above My Head? Every sentence is an example in the difference between a writer who acquired the skill and one who was born with the gift. I don’t care what the subject is: Fiction, in-your-face essays, just give me my man James. I don’t care much for sweets either, but when I want to feel like I’ve had a complete meal, I have to have some sort of dessert—the richer the better. I read somewhere that truffles are the most expensive food in the world. If that’s the case, then Franketienne’s book Adjanoumelezo is my literary truffle. Its unending explosion of inventive and tongue-tripping language is priceless. Franketienne, a Haitian author, poet, painter, playwright, musician, is a national treasure. Adjanoumelezo, which demands to be read aloud in order to be fully appreciate, is no longer in print. So, if you find a copy, treat it as you would the kind of truffles that sells for three-thousand U.S. dollars a pound. More than monetary value, Adjanoumelezo is now an old and loyal friend. When the obligation comes to read a book that leaves me feeling stranded on a sinking dinghy, I take comfort in knowing that Francketienne is on a nearby shelf, waiting like the welcoming shore. 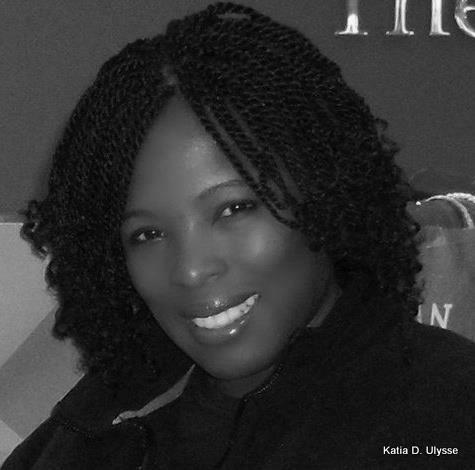 Katia D. Ulysse is a Haitian-born author. Her short stories, poetry, and essays have been published in dozens of literary journals and anthologies, including The Caribbean Writer, Meridians: Journal of Feminism, Race, and Transnationalism, The Butterfly’s Way (Soho Press, 2001), and Haiti Noir (Akashic Books, 2011). She created www.voicesfromhaiti.com, a site that highlights the beauty Haiti through creative artists. Her INNERviews and articles like “Beyond the One Drop Rule: Haitians in the 2012 Olympics” are popular among readers worldwide. It’s always a pleasure to read your blog, Jessica.. I find it impossible to narrow favourite books to five or any number; wish I could do it as well as Ms. Ulysses does. Morrison and Baldwin would definitely be in the mix though. Sold sounds interesting.